Obviously, Leah Reyes must be a weird kid, because she goes to a book signing. In this case, it is a book on the occult. As a moody goth kid, she is quite interested in black magic rituals—too interested for her own good. As a result, she will be the one most at risk from the evil spirit she summons in Adam MacDonald’s Pyewacket (trailer here), which releases today on DVD and BluRay. Forget about the stupid cat in Bell, Book, and Candle. The familiar supposedly sleuthed out by Matthew Hopkins, the notorious witch-finder general, is closer in nature, but this Pyewacket is one seriously insidious entity. Reyes and her mother had been getting on poorly since her father’s death. Frankly, the older woman bears some responsibility. Her drinking and insensitive comments did not help much, but her decision to move to an isolated cabin up north was really the last straw. So, Reyes went into the woods to perform a ceremony invoking Pyewacket, to kill her mother. Shortly thereafter, Reyes realizes she might have slightly over-reacted, but what’s done is done. Soon, she can see and hear signs Pyewacket is out there stalking her oblivious mother. Unfortunately, the gothy friends she was so upset to leave are not much help either, so she will pretty much be on her own, trying to get the toothpaste back in the tube. Pyewacket is a major step up for MacDonald, whose last film was the just-okay outdoor survival thriller, Backcountry. Basically, Pyewacket is nine parts twenty-teens moody indie horror (don’t call it “post-horror”) and one part old school satanic (or Pyewacketic) panic. He builds the fear slowly and subtly through some carefully composed scenes. Pyewacket is mostly outside our field of vision, but his presence is keenly felt. With its uncompromising depiction of family dysfunction, Pyewacket also shares a kinship with Hereditary and The Babadook. Nicole Muñoz does a terrific job humanizing the Leah, the resentful goth. Chloe Rose also freaks out quite memorably as Janice, the friend who has a bit of a bad experience. James McGowan should also earn the attention of a lot of casting directors with his brief but significant turn as bestselling occult writer Rowan Dove. There is a lot of effectively unnerving sound work going on in Pyewacket that nicely compliments Christian Bielz’s eerie cinematography. Those woods just look like a bad place to be isolated, but wireless service is surprisingly strong up there. Regardless, it is pretty scary (and dashed dark) stuff. 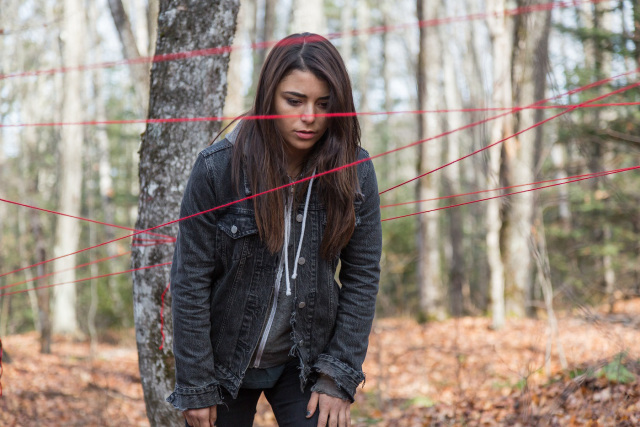 Recommended for fans of contemporary indie horror, Pyewacket is now available on DVD and BluRay.